Easter Beer Tasting - Chocolate Overload! 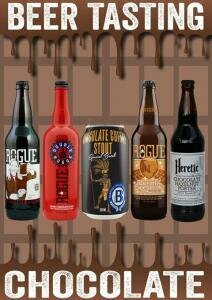 Get your chocolate hit early this Easter at the International Beer Shop! This Thursday from 4pm, Jarryd from Phoenix Beers will be in-store and cracking open 5 of their delicious chocolate filled beers (pictured) for you all to try! Prefer your chocolate on tap? No worries, we've also got 2 kegs full of chocolate-y goodness pouring from our PEGAS as well! These are Brewdog's Self Assembly Pope and Rogue's Hazelutely Choctabulous (in free Rogue branded growler)! Make sure you get down to the shop this Thursday arvo or miss out on our most decadent beer tasting ever! Cheers!